Hanoi (VNA) – Vietnam beat Laos 3-0 in its first match of Group A in the ASEAN Federation Football (AFF) Suzuki Cup 2018, which took place at the Laos National Stadium in Vientiane on November 8. Striker Nguyen Cong Phuong (Number 14), opened the score for Vietnam at the 11th minute. 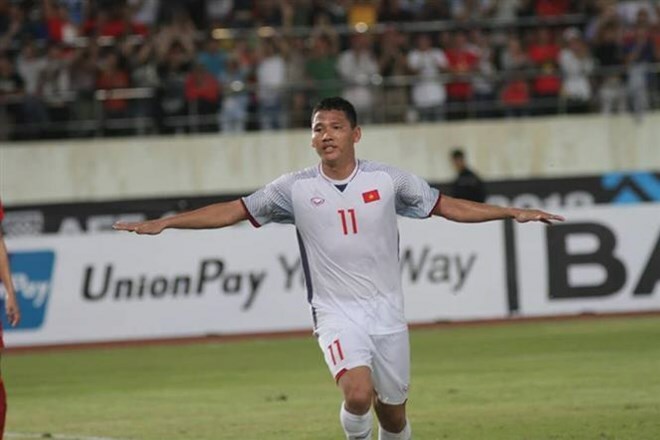 Vietnam stepped up attacks but missed many chances afterwards, until striker Nguyen Anh Duc (Number 11), found the net at the 47th minute, just seconds before the first half ended. In the second half, Vietnam continued its advantages with higher ball possession compared to its rival. Midfielder Nguyen Quang Hai (Number 19) made a goal with an exemplary free kick at the 68th minute, settling the score at 3-0. The midfielder was one of the most brilliant players of Vietnam at the Asian Football Confederation U23 Championship in January. Previously, Malaysia defeat Cambodia 1-0 in the first match of the tournament. The AFF Suzuki Cup 2018 is taking place from November 8 to December 15 with 26 matches among 10 teams. Vietnam’s national men’s football team is in Group A together with fellow South East Asian teams, Malaysia, Myanmar, Cambodia and Laos. This year, the AFF Suzuki Cup will feature a new playing format, with both home and away ties. Vietnam will face Malaysia on November 16 at My Dinh Stadium in Hanoi and will play Myanmar four days later.